/ Portable Air Compressor Anyone? Most air compressors are big noisy affairs, but not so the latest from Airman, which has settled on shrinking an air compressor into a standard drill-sized contraption called the Airgun. In fact, if you were not a keen observer, you could easily mistake it for actually being a cordless drill as the unit has been cleverly contructed to be easily held and operated in the hand as a ‘gun’. It carries its own flexible hose attached to the side that fits the most common form of tire valve, the schrader valve, and it also carries other ‘nozzles’ that are needed for inflating balls and other inflatables. 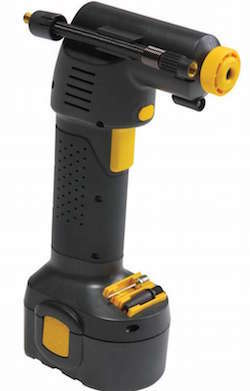 As you might have guessed with it being cordless, the Airgun is battery-operated which is unusual for an air compressor, but as a result of the compactness and the battery operation, the unit is limited in its potential uses to mostly everyday ‘household’ tasks, although it is reportedly capable of inflating a small automobile tire. For the more do-it-yourself-ers (and for inflating automobile tires more robustly), they would be better advised to opt for a more full-blown air compressor which has a far greater range of uses including operating air power tools and air paint sprayers, although even then one has to choose carefully as not all air compressors are equal!